Aim: The purpose of this study was to evaluate the adequacy of three obturation techniques namely lateral condensation, EQ Fil (backfill obturation) and thermafil (core carrier obturation) techniques using three-dimensional (3D) helical computed tomography (CT) by volume rendering method. Materials and Methods: Thirty freshly extracted teeth were randomly divided into three groups of 10 teeth each. Biomechanical preparation was done in all the teeth using rotary instruments. All three sets of teeth were placed in helical CT slice scanner and were imaged before obturation. The three sets were then obturated by following methods: Group I: lateral condensation, Group II: EQ Fil (backfill) and Group III: thermafil (core carrier obturation).Volume of the pulp chamber and gutta-percha after obturation were calculated using volume rendering technique and adequacy of the obturation techniques were calculated. Results: Mean change in lateral condensation (0.005±0.002) was significantly higher than that of thermafil obturation (0.002±0.001) [P<0.05]. Complete obturation of root canal system to the cementodentinal junction is an important goal in endodontic treatment. To achieve this, it is believed that root canal fillings must seal the pulp space both apically and laterally to prevent further apical irritation from incomplete elimination of bacterial products or continuous communication between apical tissues and oral cavity. Many techniques and materials have been used to obturate anatomically complicated root canal spaces. Gutta-percha, popularized by Bowman in 1867 is the most widely used and accepted root canal-filling material. It seems to be the least toxic, least tissue-irritating, and least allergenic root canal-filling material available. A variety of thermoplasticized gutta-percha techniques have been introduced recently and a number of investigations have evaluated the apical seal obtained by these techniques. Although, there are numerous studies evaluating the sealing ability and wall adaptation of thermoplasticized gutta-percha, there are only a few regarding the volume occupied by gutta-percha and the 3D adequacy of these techniques. Thirty freshly extracted non-carious human mandibular premolars with single straight canal were used for the study. Teeth with incompletely formed apices, calcified canals, fractures and resorption were discarded. After extraction, all teeth were stored in 10% formalin. After clearing the organic debris the teeth were subsequently stored in saline until use. Glass plates of dimension 9x 10 cm were selected. It was divided into three equal parts of dimension 3 cm in height and 10 cm in width. Graph sheets of same measurement were made and attached to the base of each glass plate. The graph sheets were used to guide proper placement of teeth over the glass plates. Teeth were then randomly divided into groups of 10 teeth each. A set of 10 teeth were placed on to the glass plate with central vertical axis in correspondence with 0.5 cm base of each 1 m division. Care has been taken to arrange all the apices of teeth to correspond to 0.8 cm from the horizontal base line of the glass plate. Access cavity preparation was done in all teeth using No.4 round bur through the occlusal surface. Gates Glidden drills were used to enlarge the coronal preparation to facilitate further instrumentation. Canal preparation was done in all the teeth using Protaper (A) 4049, 21 mm, (Dentsply, Mailleffer) rotary instruments (SX, F1, F2 series). Calcific obstructions if any were negotiated with EDTA preparations (RC Help-Prime dental products, Mumbai, India). Copious irrigation was done with 5% sodium hypochlorite and normal saline. All the canals are dried with sterile paper points. Zinc oxide Eugenol (DPI, Mumbai) was selected as sealant for all the groups [Table 1]. The mean and standard deviation of different obturation techniques were calculated before and after the completion of obturation and their volume inadequacy determined [Table 2]. One way ANOVA was used to calculate the P value. Multiple-Range Tukey Test by Tukey-HSD procedure was employed to identify the significant groups at 5% level [Table 3]. The purpose of obturating the prepared root canal space are (1) to eliminate all avenues of leakage from the oral cavity or the periradicular tissues into the root canal system (2) to seal within the system any irritants that cannot be fully removed during canal cleaning and shaping procedures. In this study, lateral condensation showed the high deviation from root canal volume of prepared canal without obturation, followed by EQ Fil. Lowest inadequacy was shown by thermafil core carrier obturation. This can be explained by the fact that lateral condensation contained more voids and the inability to adapt to the walls as explained by Schilder. The inability to adapt to the walls of root canal and the isolated concave areas in the canal creates a less dense mass which gives difference in the measured volume calculation before and after obturation. On the other hand, thermoplasticized gutta-percha techniques on application of heat, flows and adapt well onto the walls of the root canal. Application of heat by plugging further compensates for any voids within the mass and results in a whole compact mass with good marginal adaptation to the canal walls. Moreover thermafil carries warm gutta-percha up to the apical third which ensures hermetic seal rather than EQ Fil system which utilizes regular mode of vertical condensation for the apical third. This is effectively depicted in the difference in the mean value of inadequacy obtained between the EQ Fil and thermafil technique. From the study, it is evident that there is no significant difference in mean values between different study groups before obturation (P=0.45). Similarly, there is no significant difference in mean values between different study groups after obturation. Mean change in lateral condensation (0.005±0.002) is significantly higher than the mean change in thermafil obturation (0.002±0.001) [P<0.05]. This shows that the thermafil obturation technique shows more accuracy in reaching the maximum level of root canal volume possible when compared to the lateral condensation. Conventional lateral condensation technique showed the maximal inadequacy of obturation when the volume of the specimens were calculated and reconstructed. Thermafil obturation showed the least inadequacy of obturation when the volume of the specimens were calculated and reconstructed. There is no statistical significance between the lateral condensation with EQ Fil and EQ Fil with thermafil with regards to the adequacy of obturation. There is statistical significant difference between the lateral condensation and thermafil obturation technique with regards to the adequacy of obturation. 1. Stephen Cohen, Richard Burns. Pathways of Pulp. 6 th ed. United States: Mosby Publications; 2000. p. 225. 2. Pretorius ES, Fishman EK. Volume-rendered Three-Dimensional Spiral CT: Musculoskeletal applications, presented as scientific exhibit, Chicago,RSNA Scientific Assembly,1997. 3. Franklin Weine. Endodontic therapy. 5 th ed. United States: Mosby Publications; 2000. p. 429. 4. Vannier MW, Hildebolt CF, Conover G, Knapp RH, Yokoyama-Crothers N, Wang G. Three-dimensional dental imaging by spiral CT, A Progress report. Oral surg Oral Med oral Pathol oral Radiol Endod 1997;84:561-70. 5. Nielson B, Abdalmajeid MA Peters D, Carnes DI, Lancester J. Microcomputed Tomography: Advanced system for detailed Endodontic Research. J Endod 1995;21:561-8. 6. Lyroudia K, Mikrogeorgis G, Bakaloudi P, Kechagias E, Nikolaidis N, Pitas I. Virtual endodontics: three-dimensional tooth volume representations and their pulp cavity access. J Endod 2002;28:599-602. 7. Venkateshbabu N, Velmurugan N, Roy A, Kandaswamy D. Evaluation of the pulp chamber morphological measurements in maxillary first premolar in Indian population - an in-vitro study. J Conserv Dent 2007;10:119-21. 8. 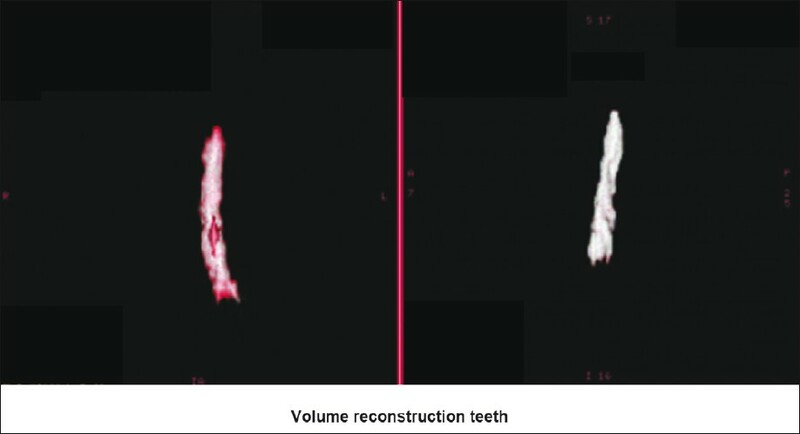 Reuben J, Velmurugan N, Kandasamy D. The Evaluation of Root Canal Morphology of the Mandibular First Molar in an Indian Population Using Spiral Computed Tomography Scan: An In Vitro Study. J Endod 2008;34:2125. 9. Gopikrishna V, Bhargavi N, Kandasamy D. Endodontic management of single root and single canal diagnosed with the aid of spiral CT: A case report. J Endod 2006;32:68791. 10. Agarwal V, Singla M, Logani A, Shah N. Endodontic management of maxillary first molar with two palatal canals with the aid of spiral computed tomography: A case report. J Endod 2009:35:1379. 11. Ballal S, Sachdeva GS, Kandasamy D. Endodontic management of fused mandibular second molar and paramolar with the aid of spiral computed tomography: A case report. J Endod 2007;33:1247-51. 12. Bhaskar SN. Orban's Oral Histology and Embryology. 10 th ed United States: CBS Publications; 1990. p. 136. 13. Ingle J, Bakland LK. Endodontics, 5 th ed. BC Decker, editor. United States: Harcourt Publications; 2002. p. 576. 14. Gulabivala K, Holt R, Long B. An in vitro comparison of thermoplasticized gutta-percha obturation techniques with cold lateral condensation. Endod Dent Traumtol 1998;14:262-9. 15. Gencoglu N, Garip Y, Bas M, Samani S. Comparison of different gutta-percha filling techniques; Thermafil, Quick-Fill, Soft Core, Microseal, System B and the lateral condensation. Oral Surg Oral Med Oral Path Oral Radio Endod 2003;96:91-5. 16. Gencoglu N, Garip Y, Bas M, Samani S. Comparison of different gutta-percha filling techniques; Thermafil, Quick-Fill, System B and the lateral condensation. Oral Surg Oral Med Oral Path Oral Radio Endod 2002;93:333-6. 17. Weller RN, Kimbrough WF, Anderson RW. A comparison of thermoplastic obturation techniques; Adaptation to the canal walls. J Endod 1997;23:703-6. 18. Clinton K, Van Himel T. Comparison of a warm gutta-percha obturation technique and lateral condensation. J Endod 200127:692-5. 19. Gutmann JL, Saunders WP, Saunders EM, Nguyen L. An assessment of the plastic Thermafil obturation technique. Part 2. Material adaptation and sealability. Int Endod J 1993;26:179-83. 20. Wolcott J, Himel VT, Powell W, Penney J. Effect of two obturation techniques on the filling of lateral canals and the main canal. J Endod 1997;23:632-5. Rodrigues, A. and Bonetti-Filho, I. and Faria, G. and Andolfatto, C. and Camargo Vilella Berbert, F.L. and Kuga, M.C.